[PDF] Sneaky Blends: Supercharge Your Health with More Than 100 Recipes Using the Power of Purees | Free eBooks Download - EBOOKEE! Description: The New York Times bestselling author of The Sneaky Chef brings us the next trend in healthy eating with delicious and easy recipes whipped up with nutrient-dense purees to create leaner, cleaner yet ridiculously tasty meals. BLEND (blend) NOUN: a combination of different tastes made from superfoods, like blueberries, kale, and broccoli that are packed with disease fighting phytonutrients, fiber, and low in calories. 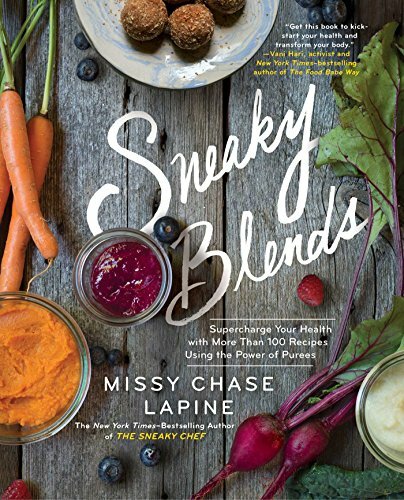 When the New York Times bestselling Sneaky Chef took off, Missy Chase Lapine knew parents were finally getting their kids to eat healthy with hidden veggie purees (a.k.a. Blends). What surprised her, though, was that those same parents were using Blends in their own recipes and feeling more energized. Taking her cue from those parents, Missy is on a mission with Sneaky Blends to show how anyone can eat healthy without sacrificing taste. Starting off with fifteen signature Base Blends, such as Butternut Squash-Apple, Black Bean-Blueberry-Baby Kale, and Carrot-Sweet Potato, Missy shows you how these nutrient packed blends can kick start your healthy lifestyle. When these blends are added to your favorite recipes or one of Missyâ€™s delicious recipes like Zucchini Pasta Piccata, Chai Tea Smoothie Bowl, Cheesy Kale-Basil Souffle, Meaty Mushroom Bolognese, or 45-Calorie Pumpkin Whoopie Pies, they instantly become healthy. This is healthy eating without deprivation! Missy also has created the Blends Cleanseâ„¢, a 3-day Body Reboot that you can tailor to your own lifestyle, giving you a diet do-over and setting you on the path to weight loss. Full of gorgeous color photos and tips and tricks to start blending, this is the only cookbook you will need to detox and transform your overall health while still enjoying delicious meals. No comments for "[PDF] Sneaky Blends: Supercharge Your Health with More Than 100 Recipes Using the Power of Purees".